Have you ever come home after a long day, feeling tired out and hungry, and struggled to decide what to make for dinner? Or have you ever had a meal in mind, but when you opened the refrigerator or the pantry, realize you didn’t have all of the ingredients you need? I’m assuming most of you have experienced this at least once; I sure have! After a long day, sometimes the last thing I want to do is think about what to make for dinner. Not only do I struggle to think clearly when I’m hungry, I also tend to make less healthy choices. Inspired by a meal planning article I saw on Pinterest, I decided to change my approach to dinner time and plan a month’s worth of meals in advance. I created an Excel spreadsheet (yes, I’m an engineer) of my go-to dishes and sorted them by main ingredients (chicken, beef, fish, vegetables, etc.). I printed out a blank calendar and utilized my list of go-to meals to plot them out on my calendar for the month. Not only does this solve my “what should I make for dinner” question after work, but I can plan out my groceries the week before and utilize Amazon Fresh to have them delivered to my door on the weekend. If you haven’t tried Amazon Fresh and live in an area that supports it, I’d highly recommend trying it out. And no, I’m not just saying that because my husband works for Amazon. It’s super convenient and saves time. Not only can you shop through an app on your phone, you don’t need to leave your house and deal with crowded aisles and long lines! I follow some trends when planning my meals. For example, I typically plan a meal that takes longer to prepare on Sundays because I have extra time to spend in the kitchen. I make extras so I can save leftovers for Mondays. On Thursday, my husband and I have our pizza and wine nights; neither of us can remember why we started doing this, but it’s been a tradition for about five years and something we look forward to each week! I also decided that on Wednesday nights I’d make an entree-style salad. I’ve tried a few great recipes by Giada De Laurentiis and Gwyneth Paltrow, but I’m always looking for new ways to enjoy salad. 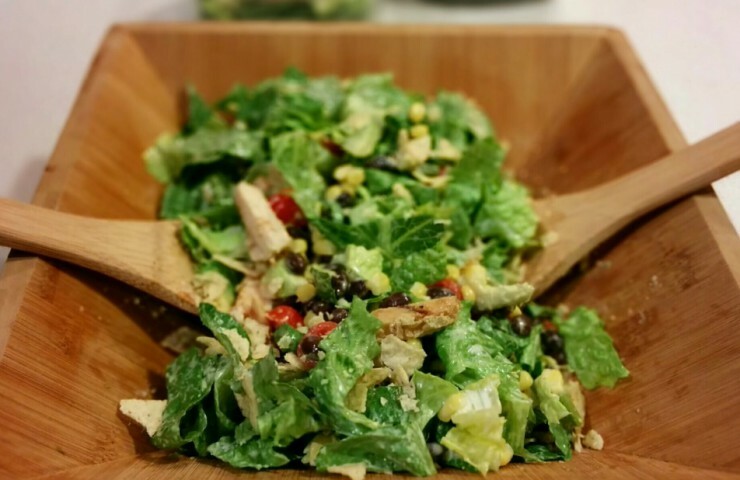 My latest salad creation was a BBQ chicken salad with a Mexican twist. It’s very easy to throw together and makes a quick weeknight meal. The first step is to defrost a chicken breast (or two depending on how many people you’re cooking for) and marinate it in barbecue sauce. I usually do this the night before and let the chicken marinate all day. If you don’t marinate overnight, aim for at least 30 to 60 minutes to obtain great barbecue flavor. I like using my CorningWare dish for marinating because it has a lid with a tight seal. Once the marinating is done, the next step is cooking the chicken. This could also be done in advance if desired. Depending on the weather and how busy our rooftop deck is, I either grill the chicken outdoors or use my Le Creuset cast iron grill pan and cook the chicken on the stove top. Cook time will vary based on size and thickness of your chicken, but I plan for about 20 minutes; cook until there is no pink visible. While the chicken is cooking, prepare the salad. Wash and dry romaine lettuce (or any leafy greens) and give it a rough chop. Add the lettuce to a large salad bowl, then add in diced raw vegetables, like cucumbers, sliced carrots and pea pods. Slice cherry tomatoes in half and add to the bowl. Rinse and drain a can of black beans and add about half of the can to the salad. Measure out about one cup of frozen corn into a microwavable bowl, top with water, and microwave for one minute. Drain the corn and add to the salad bowl. Use a pair of salad tongs to give the salad a quick toss. Slice an avocado in half, remove the pit, and use a knife to cut the avocado in both directions while still in the shell. 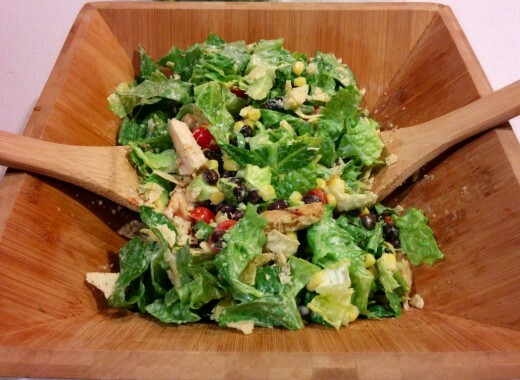 Use a spoon to scoop out the cut avocado and place directly in the salad bowl. I use one half of an avocado per person. I prefer to add salad dressing at this point and mix it together before serving, but feel free to skip this step and let your guests add their own dressing. I opt for a very light application of ranch dressing, but if you prefer another dressing, go for it! Give the salad another quick toss to distribute the dressing evenly. Once the chicken is done cooking, let it sit for about five minutes to avoid having the juices escape. 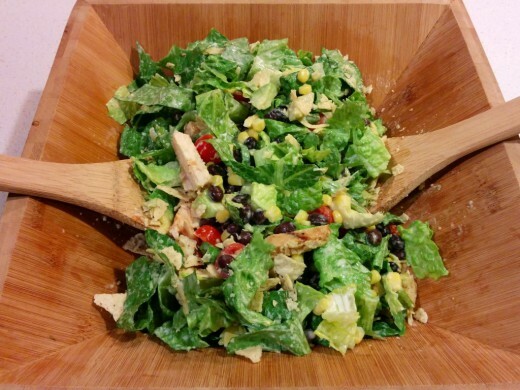 Use a sharp knife to slice the chicken into thin strips and place on top of the salad. If desired, top the salad with shredded cheddar cheese and/or crushed tortilla chips. Divide between serving bowls and enjoy immediately! Defrost a chicken breast and marinate it in barbecue sauce overnight or at least 30 to 60 minutes. Cook the chicken on the grill or use a cast iron grill pan on the stove top. Cook time will vary based on size and thickness of your chicken, but cook until there is no pink visible, about 20 minutes. While the chicken is cooking, prepare the salad. Wash and dry romaine lettuce (or any leafy greens) and give it a rough chop. Add the lettuce to a large salad bowl. Add in diced cucumbers, sliced carrots, pea pods, and cherry tomatoes. Rinse and drain a can of black beans and add about half of the can to the salad. Add one cup of cooked corn. Use a pair of salad tongs to give the salad a quick toss. Add in sliced avocado, then add a very light drizzle of salad dressing. Give the salad another quick toss to distribute the dressing evenly. Once the chicken is done cooking, let it sit for about five minutes, then use a sharp knife to slice the chicken into thin strips. Add on top of the salad. If desired, top the salad with shredded cheddar cheese and/or crushed tortilla chips. Divide between serving bowls and enjoy immediately!